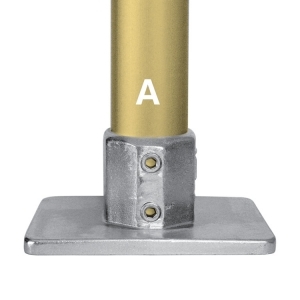 Type L148 is a structural base fixing used to fix down guardrail and balustrades. 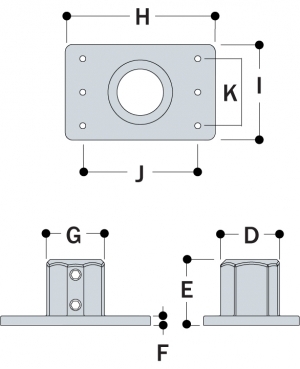 This fitting is available with either two or four fixing holes, which are of sufficient diameter to give a good fixing with either a mechanical or chemical anchor. The two socket set screws give greater stability to the upright. It is recommended that fixing holes be in-line with the applied load. Ø indicates diameter of fixing holes. Note: The L148-9/2 has two holes; the L148-9/4 has four holes. L148-9/2 2.49 lbs. 9 3.07 in. 3.43 in. 0.47 in. 3.03 in. 7.8 in. 6.02 in. 1.77 in. 0.71 in. L148-9/4 2.49 lbs. 9 3.07 in. 3.43 in. 0.47 in. 3.03 in. 7.8 in. 6.02 in. 1.77 in. 0.55 in.